No, in case you were paying attention, you did not miss posts on rides #2 or #3. Because ride #2 was to my regular library, I didn’t think to take photos inside, so I want to go back and get some to show it off properly. And I had a good portion of the post for ride #3 done when I realized that I wanted to include shots that are on Rudi’s phone (and he’s sleeping). For this ride, the first of the longer ones I was planning for Coffeeneuring, I thought I’d thought things out enough. I’d requested some of my holds to be delivered to libraries around the city, hoping they’d arrive spaced far enough apart to accommodate my plan. I got the notice that Exit West had arrived at the Rosedale Neighborhood Library, and knew that library was the nearest branch to Mason Dixie Biscuit Company, where I planned to do the drinking portion of my ride. The ride out went mostly fine, given I wasn’t fully sure of where I was going and that I’d put my phone in my pannier, rather than leaving it accessible for consultation, which meant I kept having to stop after a certain point. The Rosedale neighborhood is in Northeast, just past where the H St. Corridor development extends, which means it’s a diverse neighborhood. 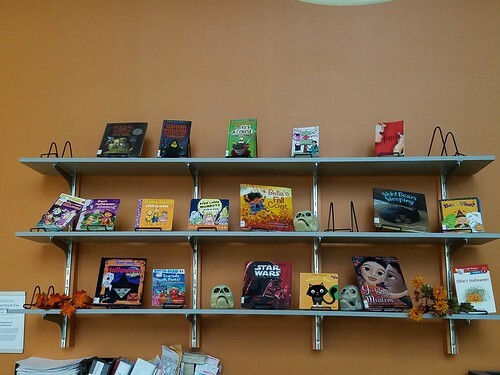 On this Saturday before Halloween, there were lots of kids about and holiday preparations were firmly underway. 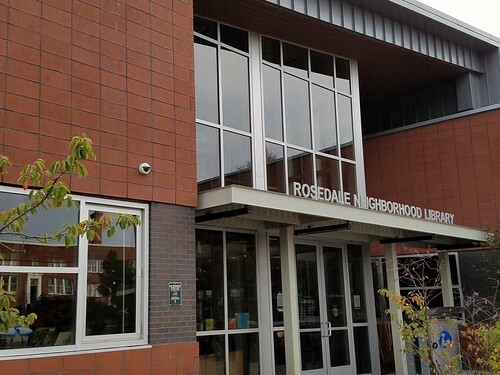 The Rosedale Neighborhood Library, which shares space with the local parks & rec/community center, was built in 2012 to replace two of the one-room kiosk libraries that had served the community since the 1970s (you can see the H St. one, now an arts space, here). Like Northwest One, Rosedale’s branch is a large, communal space divided into sections using low-rise stacks. 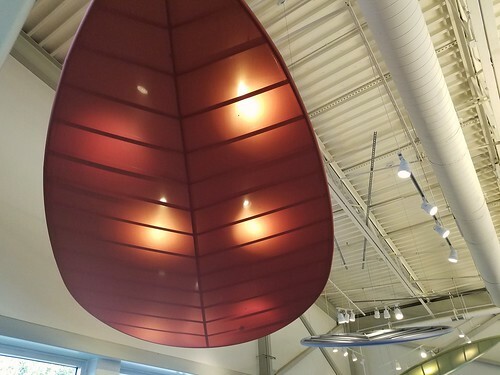 It’s got an open industrial ceiling, but they use these cool leaf mobile sculptures to help make it seem more homey, to help soften the light, and, I’m guessing, to help dampen the sound. This Saturday afternoon, the library was doing brisk business and I don’t think there were any empty chairs. 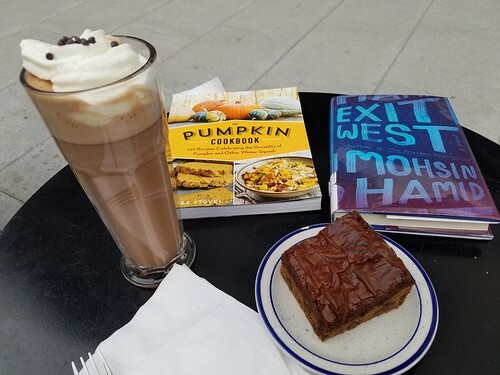 I quickly found Exit West, perused the videos, and then went over to check out the new releases shelf, where I found a cookbook devoted to pumpkin/squash recipes that needed to come home with me. Back outside, I looked up directions to Mason Dixie, only to discover, thanks to Google’s omnipresence, that it closed in 15 minutes. I’d considered many details, but never that a restaurant would close mid-afternoon. Clearly that option was not going to work. Retracing my steps homeward, I thought about where I could head that would still be open by the time I arrived. A Baked Joint came to mind and I pointed my bike toward the Mount Vernon/NoMa area of town. A Baked Joint is a sister establishment to my favorite cupcake shop in D.C. and I hoped they’d share the same approach to making hot chocolate, which involves a large frappe glass, oodles of whipped cream, and chocolate chips. Should you find yourself craving cocoa, they have my vote for best in region. The bakery case was starting to look a little bare, so the cashier recommended this half-brownie-half chocolate chip cookie bar. It was large and rich, and I definitely should have brought half home with me to eat later instead of gorging myself on the entire thing in one sitting. I found a table outside next to their greenspace and read my books for a while. I had just commented to the woman reading at the table next to mine that I kept hoping the light above us would turn on when I looked down and realized there was a rat near my foot. (I had seen the holes in the ground when I sat down, so I knew there was a burrow, but I’d figured they’d wait until it was legitimately dark to come out. Oops!) We both agreed that was the sign that it was time to move! After taking my dishes inside, I came back out to the bike racks (the cafe is conveniently located next to a bike shop, so there were lots of places to park) only to discover that my seat cover had been stolen. When I’d arrived, some young men had been hanging out nearby and while I was inside I noticed they were pulling wheelies awfully close to the tables (I have seen some very balanced guys ride wheelies for blocks in traffic, so I will give them the benefit of the doubt that they were totally in control and not actually endangering anyone). Because they were gone when I came back outside, I didn’t give them another thought until I returned to the bike. And I didn’t actually see them take it, so I could totally be wrong. They didn’t take my pannier or any of my lights, thank goodness, so it clearly had been a stupid dare, but since I use a seat cover because my silicone gel-filled seat has some big, leaking holes in it, I was irked. Luckily, I had a plastic bag I use for rain protection in my pannier, so I tied that over the seat and rode home on it. Since the seat cover had big chunks of silicone stuck to the inside, I’m really hoping whoever stole it decided to put it on their head and then got them stuck in their hair. It would serve them right! Much to my delight, the company where I buy the seat covers (I’d wondered if they’d be stolen, so had ordered two and then had the first one taken from in front of my office the first week I used it) had a free shipping sale two days later and new ones (3 this time, with one being boring black so as to attract less attention than the ones I prefer) arrived within the week. So, not quite the ride I’d planned for or wanted, but still it was good to check out a new neighborhood and a new library. If you missed it, this post explains what Coffeeneuring is and why I’m visiting local libraries during it. Category: books,dc life,sports. There is/are 3 Comments. 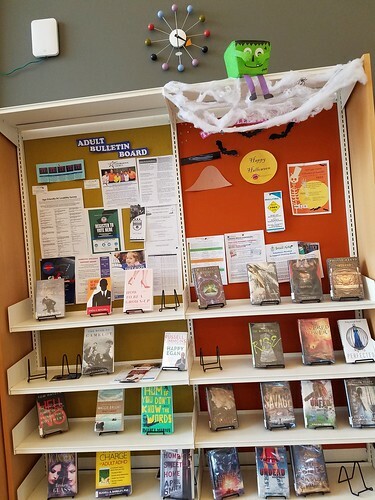 I visited a “new to me” library on Saturday also! It was a wonderful visit! @Kat: Awesome! This has been a really fun experiment! @kathy b: Seriously, so good.